Earthdance, called "the Live Aid for the new millenium", will be awarding legendary composer and musician Kitaro with its "Artist Of Peace Award" this September 2004. Just days prior to EarthDance comes Reinterpretations, a compilation spotlighting remixes of Kitaro tracks by high-profile and hot underground producers, all of whom were given the directive of putting their unique spin on the timeless music of Kitaro. Not your standard "remixes", the tracks featured on Reinterpretations are unique, individual reinterpretations of Kitaro's vision - "to create music that unites, heals, and soothes the human spirit". 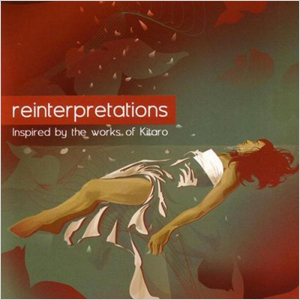 Reinterpretations features twelve remixed Kitaro tracks, including remixes by Peas, Appogee, Turbotito (Junior Senior) and Timmy the Terror (Ima Robot). Truly a unique album, each producer deftly captures the essence of Kitaro, while lending the original compositions new dimensions filtered through their individual artistry. An eclectic mix and full of depth, each track featured on the album shares a common thread, where ancient sounds and futuristic beats merge creating an entirely new sound and style. Earthdance: The Global Festival For Peace, has been called "the Live Aid for the new millenium." Uniting world communities in support of non-profit humanitarian, environmental, and peace-related causes, EarthDance is the largest synchronized music, dance and lifestyle event in existence. Solely through massive grass roots momentum, it has grown more than ten-fold in size since its 1997 inception, and the 8th annual occurrence of this 24-hour international phenomenon on September 18, 2004 will bring together 200,000+ people in over 130 cities and 50 nations.